Unprecedented melting of Greenland’s ice sheet this month has stunned NASA scientists and has highlighted broader concerns that the region is losing a remarkable amount of ice overall. Check out this Huff Po article for more info: Greenland Ice Melt, Measured By NASA Satellites, Reaches Unprecedented Level. According to a recent NASA press release, about half of Greenland’s surface ice sheet naturally melts during an average summer. But the data from three independent satellites this July, analyzed by NASA and university scientists, showed that in less than a week, the amount of thawed ice sheet surface skyrocketed from 40 percent to 97 percent. 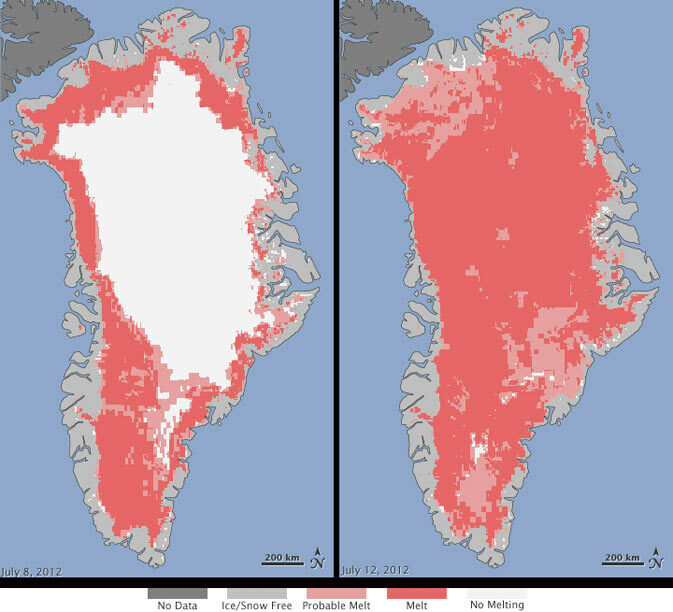 Extent of surface melt over Greenland’s ice sheet on July 8 (left) and July 12 (right). A World Without Coral Reefs – NYTimes.com We’re all climate change idiots!